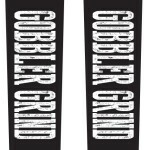 Check out this year’s Gobbler Grind merchandise available for purchase when you register. The Training shirt or tank will be shipped to you at the time of purchase. All other pre-purchased merchandise will be available at packet pick up. Any remaining items will be available for purchase on race day in the Retail Tent. 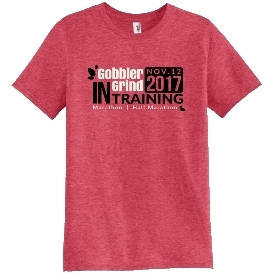 Heather red 50 % poly/50% cotton training shirt to get you ready for this year’s Gobbler Grind! 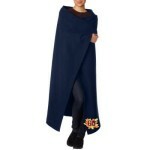 This product will be shipped to you at the time of purchase. 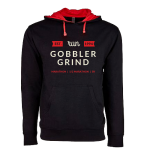 Heather red 50 % poly/50% cotton women’s training tank to get you ready for this year’s Gobbler Grind! This product will be shipped to you at the time of purchase. Black long sleeve french terry hoodie, with red inside the hood.